This is quite good…we often lose sight of the fact that those handouts are, in fact, benefits. In Canada, the Conservatives do the same thing when they try to curry favour with “hardworking middle-class families” at every turn. What they are doing, in fact, is studying the electoral map, determining where the low hanging fruit is, and then buying votes by whatever means possible. In this case, they make certain people (the hard working middle class) think they’re special and hard-done-by, first by fomenting resentment towards “the others”, and then taking advantage of that resentment. That objective is re-election, by whatever means possible, regardless of how divisive the strategy. I think it’s amazing that even in countries with robust, agreed-upon benefits (such as Canada and the UK) politicians on the right can get away with spouting such distortions. I can never go into politics, just like I could never become a manager at work and drink the company kool-aid. Real social security is a network of peers, not the far-removed and unreliable hand of the state. Much as I detest the obsession with “hard-working families”, I think less effort would be spent and better results would be obtained if we worked towards not needing state benefits to live. Instead of complaining about benefit cuts, let’s propose other ways for us and those around us to thrive. I prefer not to depend on the bounteous whims and ulterior motives of distant people with very different priorities to my own. There are better ways to skin the cat. The left of course are equally adept at such propaganda, as the ‘poor’ are also nearly always pre-fixed as ‘honest’, implying that those not ‘poor’, who make money – whether a CEO, a banker or a shop-keeper – are somehow not ‘honest’. Totally agree with Briony, but I think that network disappeared with the Industrial Revolution, and continues with the forced migration of individuals to find work. It may never return. I’ve never seen the poor prefixed as honest. “The honest poor” – it’s just not an expression. And the left aren’t in a position to be producing propaganda on anything like the scale of the Tories: they’re all but completely absent from the government. 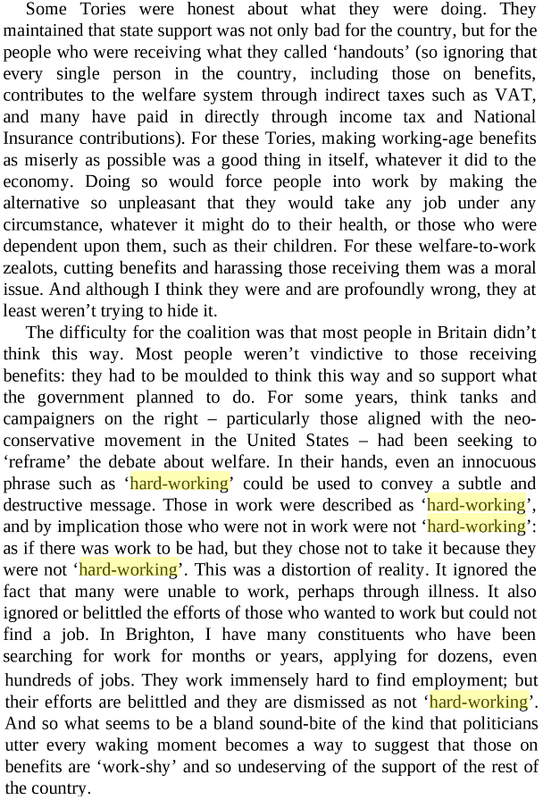 There would also be little motivation for such propaganda: the motivation for the government’s use of “hardworking”, however, is explained very nicely in the excerpt. Mark – I think those networks are still there, you just need to seek them out. There are Friendly Societies, Credit Unions, skillshare groups, bartering groups, churches and other religious groups who support each other in these ways, eco-villages and communal living projects, extended families and groups of friends who stick together. I am part of a social group who pass outgrown kids stuff around, watch each others kids without keeping score, share garden/allotment gluts and help each other out when someone is ill. When I was in hospital for 3 months, these amazing people looked after my children and elderly mother, fed my family and helped my husband keep my business going (while he still had a proper 9-5 job and commute). The state’s response was to “invite” me to unplug from my drip and attend an assessment interview 3 miles from my hospital bed. I didn’t go. Full time working does, however, make it harder to contribute to and benefit from such networks. And you are quite right about enforced labour migration. I hold it to be one of the unadmitted aims of the 50%-of-youth-to-university target (as well as reducing unemployment figures and creating massive debts).